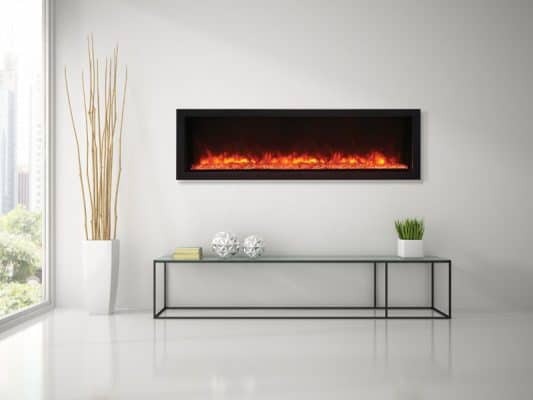 Stylish Fireplaces is proud to provide our customers with elite, top-of-the-line electric fireplaces and is pleased to present the fine line of Remii products. 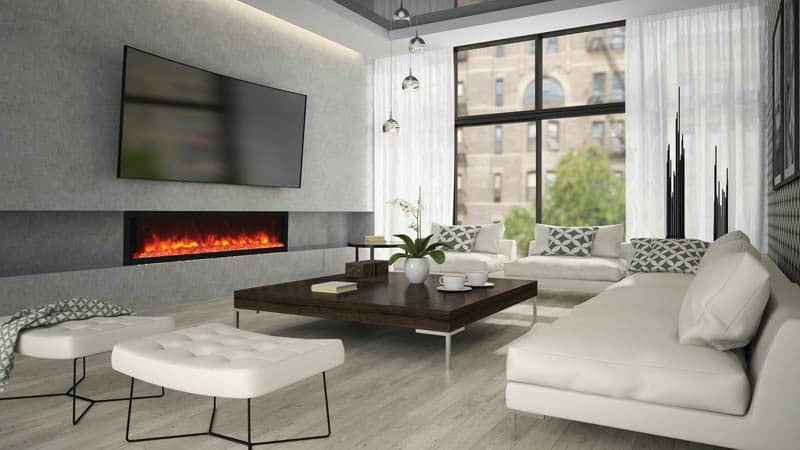 The company has been supplying homes, restaurants, offices and other types of commercial settings with a wonderful variety of elegant electric fireplaces for close to 40 years now. Each carefully-constructed fireplace features remarkable life-like flames and is built with the most caring workmanship in the fireplace and heating industry. Remii fireplaces offer an attractive, modern design along with creative innovative features which are ideal for both indoor and outdoor use. The wide variety of designs are second to none when it comes to versatility and creativity and the selection of sizes make them perfect for rooms of any size. Remii electric fireplaces are built for easy installation which means you’re able to enjoy their popular line of products almost instantly. There are three different Remii styles to select from which are the XS, XT and DE lines. The ES line of fireplaces are extra-slim models which are just four inches in depth. The XT products are extra tall units which reach 18 inches in height while the DE series come with a depth of 12 inches. Remii offers the XT-45, XT-55 and XT-65 models to choose from. These are 45, 55 and 65-inch wide built-in fireplaces with an 18-inch tall viewing area which are ideal for use both indoors and outdoors. These fireplaces come with a vibrant array of colours, deep mirrored-media trays, black glass, pebbles, stones, log sets, ICE media and vermiculite embers which allow customers to completely customize the appearance of their fireplaces. The multi-colour flame options are the result of three LED light strips and can be controlled remotely. The fireplaces can easily be installed with your personal selection of finishing material and the flames can be operated without the heat. 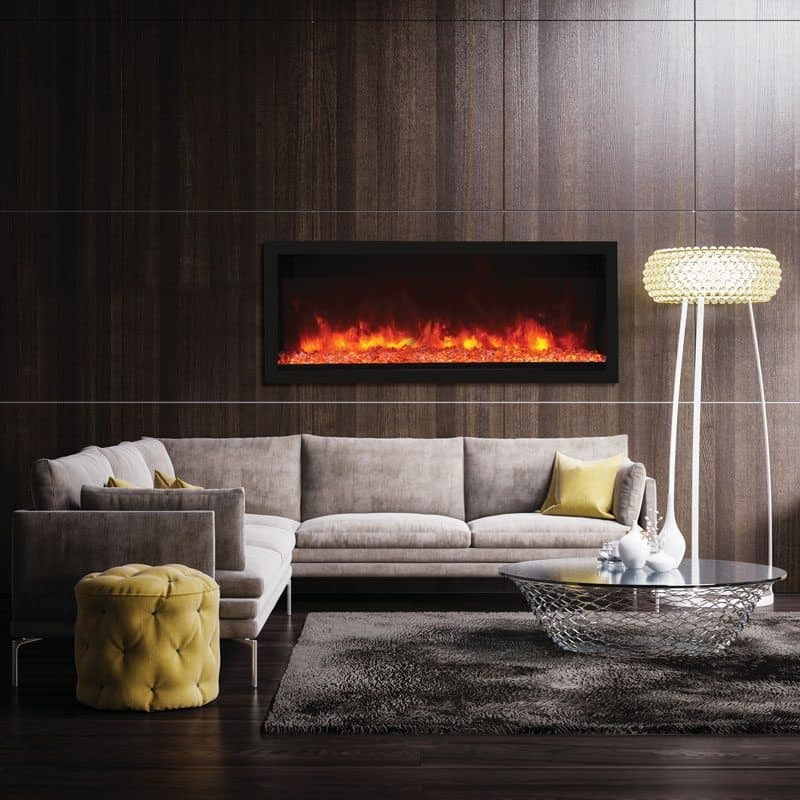 The stylish line of Extra Slim Fireplaces offered by Remii include the XS-35, XS-45, XS-55 and XS-65 models. These units come in four sizes which range in width from 35 to 65 inches, but are just four inches deep and are built for both indoor and outdoor use. They can be operated with a convenient remote control which also changes the colour of flames from blue to rose to violet to yellow to orange. You’ll have a choice of finishing materials while the units also come with a log set and choice of embers, rocks and pebbles. Each easy-to-install model comes with a two-stage heater, but the flame can also operate independently of the heat. 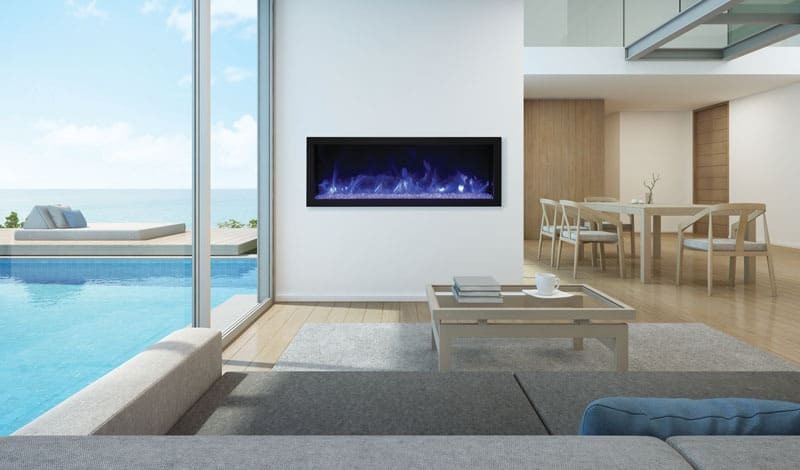 The state-of-the art Deep Electric Fireplaces by Remii are the popular 45-De, 55-DE and 65-DE models which range in width from 45 to 65 inches. However, the units are 12 inches deep and also suitable for indoor and outdoor usage. These stylish units will easily become the focal point of any room and can heat a space of up to 500 square feet. The finishing material is your choice such as black metal surround. The kaleidoscope of vibrant flame colours and ambient canopy lighting options can quickly and easily be changed with the handy remote control. There’s also a choice of embers, black fire glass, pebbles, stones and 11-piece log set for each model. Remii’s innovation flame technology help you to receive all the benefits of a traditional wood burning fireplace and the ease of an electric fireplace rolled into one. 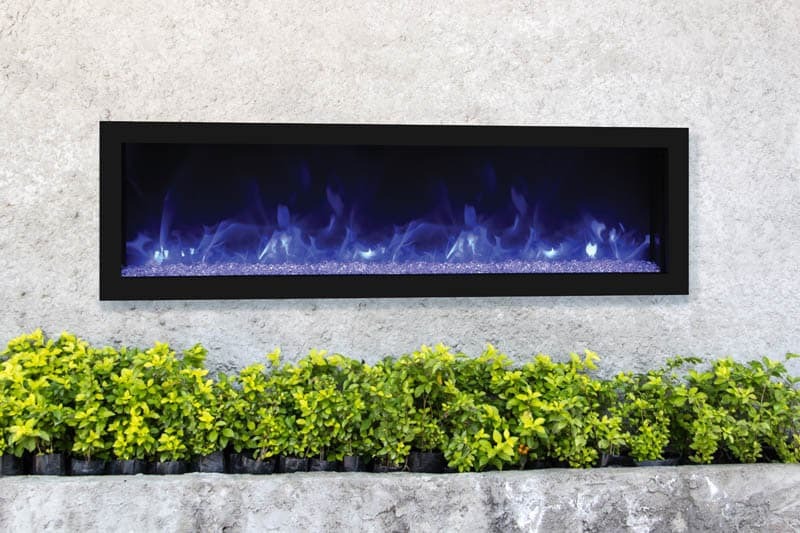 Whether you are looking to mimic a traditional fire or add a piece of artwork with blue glowing glass embers, Remii fireplaces can exceed your expectations. 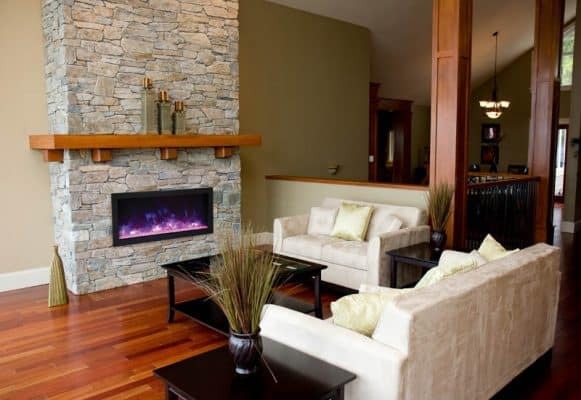 Stylish Fireplaces is an electric fireplace dealer and interior design service in Toronto. 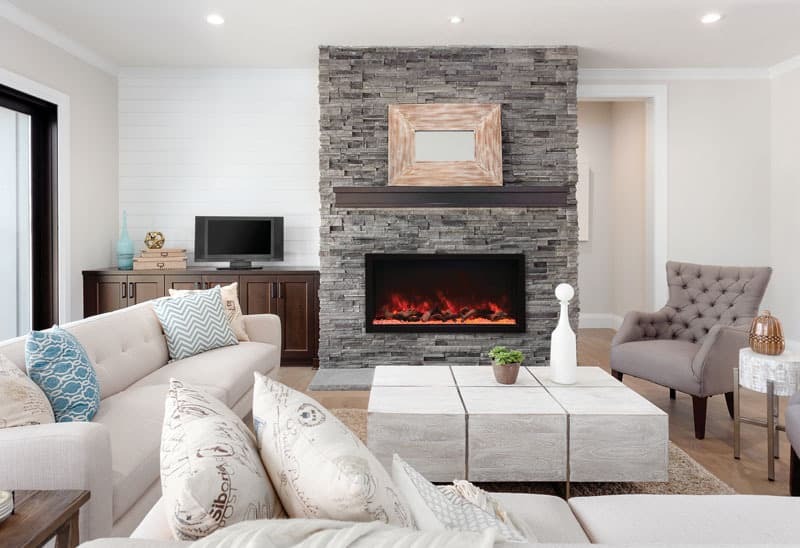 We have the largest display of electric fireplaces in the GTA and offer custom design services to ensure the best electric fireplace match for your home. 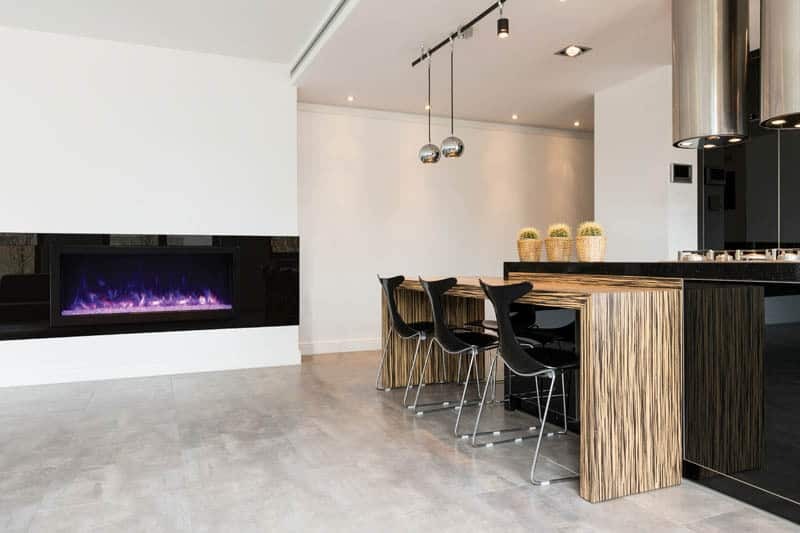 Stop by our Toronto showroom to find the perfect Remii electric fireplace for your home.